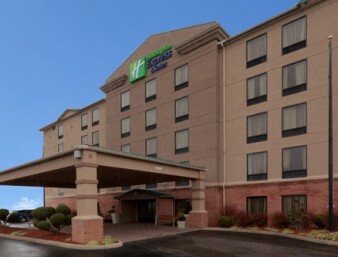 The Holiday Inn Express Hotel & Suites Charleston-Southridge features 84 guest rooms five levels. We are conveniently located between two shopping plazas and two dozen restaurants are nearby. Additionally, we are convenient to downtown Charleston and Yeager Airport. Hotel features include: two meeting rooms equipped with high speed internet access, an indoor pool, hot tub, free local phone calls and a complimentary continental breakfast. Enjoy a unique breakfast experience at our new Express Start Breakfast Bar served every morning featuring a selection of fruits, juices, cereals, breads/pastries, and eggs. We have also created the world’s best tasting cinnamon roll. Guest room amenities include: coffee makers, high speed internet access, iron & ironing boards, hairdryers and two phones with two separate phone lines, mini refrigerator and microwave. Visit South Charleston, WV and stay smart at the Holiday Inn Express Hotel.